The weather forecast is dire, and we are staying home for Thanksgiving. I am sad to not visit with relatives, but I am unwilling to risk life and limb. I have already received a guilt-inducing e-mail (although I don’t really believe it was intended as such—I’m just an easy target). As I write this, the first snowflakes are visible out my office window. I think our family should just move it up anyway. But with everyone else’s extracurricular schedules and comparative proximity to each other, I’m pretty sure no one would go for it. In ~48 hours, I will be either driving 7 hours south on Wednesday, spending Thanksgiving with relatives on Thursday, driving 2 hours further south and back on Friday to see more relatives, then driving 7 hours home on Saturday so that Tim can pack and get to the airport on Monday morning to depart on another business trip. Or not. Every one of those plans is in peril: Tim is sick. I may be getting sick. It might snow or wintrymix on Wednesday, one of the worst travel days ever. The business trip, thanks to typical office snafu, may be canceled. I don’t want to have to cancel. And I don’t want to go for Christmas instead. I’m feeling guilty about the relatives thing. And I will genuinely miss them. I will not voluntarily drive in bad weather. I will not be able to sleep in a double bed with someone else if one or both of us is sick. Some days it is good to give thanks for long distances; others, for short ones. 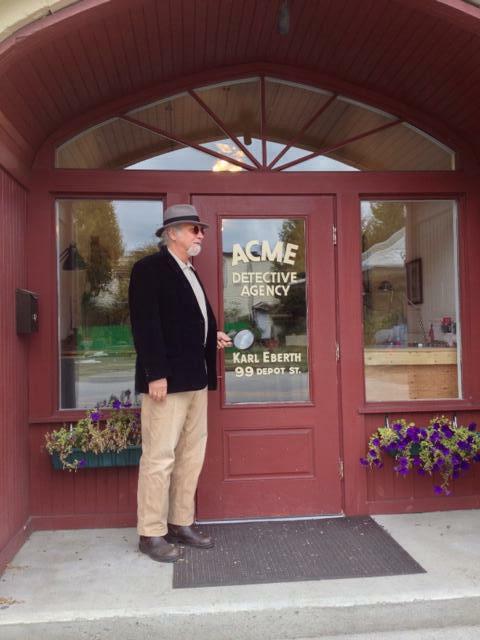 When the door to your friend’s business says Acme Detective Agency, even if the bulk of the business will be bookbinding, not detection—or is bookbinding a red herring?—you attend the grand opening dressed in a short skirt and trench coat. After all, you’ve already inquired as to his need for an assistant. You are in fact the fourth woman to ask about this, and he is willing to hire every one of you, noting, of course, his current lack of cash. He jokes about TV and Angels and how you are the only blonde, so you’d get top billing, of course. Funny. You didn’t realize you were blonde—how dark the other women must be. He talks about his cases—so far, people trying to find other people. Maybe he could pay you $30 for a little work. You wonder what you can offer beyond deeper Internet digging, a phone call or two. You dream instead of high-heeled reception, a bottle of whiskey in the file drawer, the heft of the black receiver plucked from the cradle of the insistently ringing rotary telephone: Acme Detective Agency, you say. How can we help you?